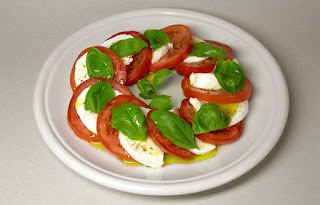 The creamy cheese from Southern Italy known as mozzarella di bufala or buffalo mozzarella is an important part of the Italian cuisine, well know for its versatility in the kitchen and for its special characteristics that make it a perfect ingredient for Mediterranean dishes like pizza, pasta and the Caprese salad. In this article we explore the origin, history and the characteristics of buffalo mozzarella, a cheese that is synonymous with Italy and an important part of the Southern Italian cuisine. Buffalo Mozzarella is a traditionally southern Italian mozzarella cheese made from the milk of the domestic water buffalo rather than from cow's milk. 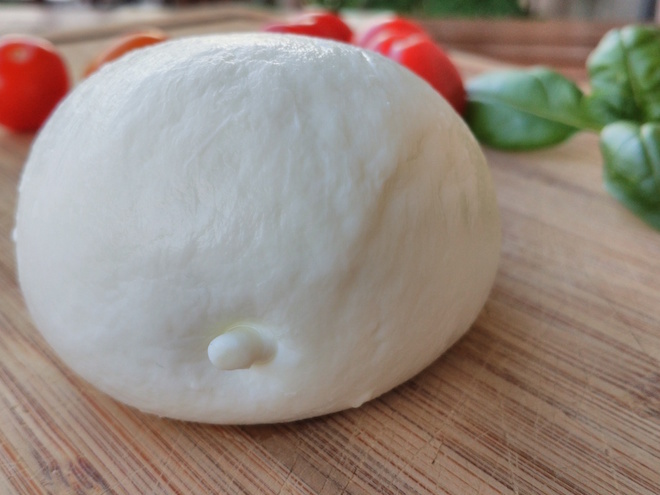 The buffalo mozzarella from Italy sold as Mozzarella di Bufala Campana is protected under the European Union Protected Designation of Origin (PDO) status and may only be produced in select locations in the regions of Campania, Lazio, Apulia and Molise. 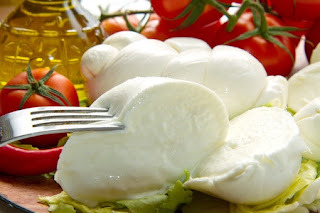 Mozzarella is the diminutive form of the verb 'mozzare', which means 'to cut off' derived from the Neapolitan dialect spoken in Campania in southern Italy. It refers to the process of making mozzarella, as the large mass of curd is cut up by hand, into smaller sizes. The old basic process of making mozzarella involves heating and hot spinning the curdled milk, so that the acidity is reduced. The resulting curds are then molded by hand into mozzarella. At the core of the production process is the spinning which allows the curds to become plastic and ready to be pulled in one continuous filament, usually longer than a meter and then formed into various forms of mozzarella. Buffalo Mozzarella is produced exclusively from fresh buffalo milk, rennet (a natural milk coagulant), salt and milk enzymes and, after drawing and moulding, may also be smoked, but only using natural, traditional procedures. The cheese is soft with a rubbery texture, has mild flavor and is known to be rich in proteins, calcium, mineral salts, iron and vitamins. The origin of the buffalo mozzarella is said to be the Campania region, as implied by its PDO name Mozzarella di Bufala Campana, where it has been produced in the provinces of Caserta and Salerno for many centuries. The earliest references to Mozzarella can be found in the 12th century when Benedictine monks of the San Lorenzo monastery in Capua, a town in the province of Caserta, Campania, prepared a cheese called 'mozza' from cow's milk. During the 13th century, the dairy farmers in Campania are said to have started making the mozzarella cheese from buffalo milk, mainly for local consumption, which at that time was regarded as a cheaper alternative to cow or goat’s milk cheese. 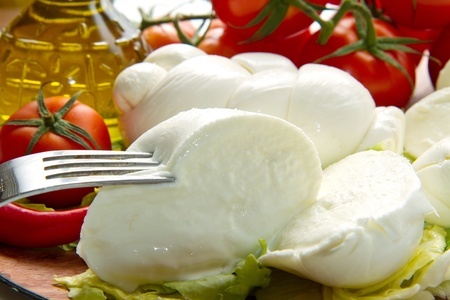 A reference to buffalo mozzarella is made by Bartolomeo Scappi in his book ' L'arte Et Prudenza D'un Maestro Cuoco' published in 1570, which is considered as the first documented reference to the cheese. Bartolomeo Scappi was a famous chef of the Italian Renaissance and served as a personal cook for two Popes. Until the 18th century, buffalo mozzarella was produced in small quantities in the Campania region and consumed locally. Its consumption increased and spread across the south of Italy starting from the early 18th century due to its rich flavor and texture and its adoption by the well known farmhouses who started using the buffalo milk for producing mozzarella. One of these farmhouses was the Bourbon Royal farmhouse near Carditello, Naples which was breeding buffaloes to produce mozzarella cheese around the mid 18th century. The production of buffalo mozzarella increased in the 19th and 20th century and it became an important part of the agriculture and wider economy of Campania. In 1996, Campania's buffalo mozzarella was granted PDO status by the European Union, a mark of authenticity and quality. 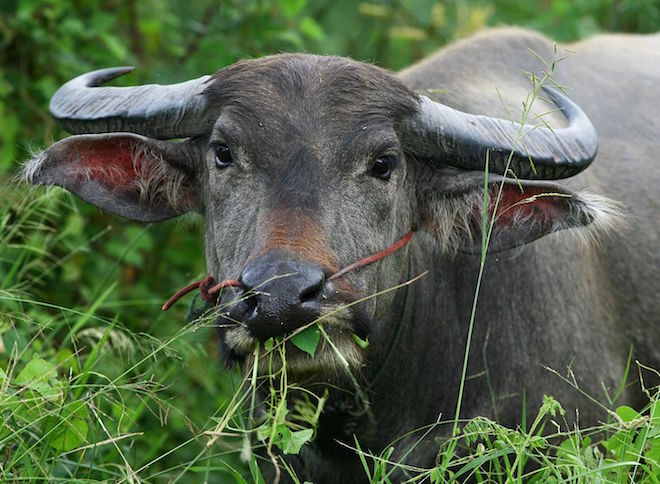 The history of the water buffalo in Italy is important to consider as it is closely tied to the buffalo mozzarella cheese. The water buffalo originated in Asia and is known to have been domesticated in the Indus Valley and Mesopotamia civilizations between 2000 BC and 3000 BC. Although there are a few different theories about the introduction of the water buffalo to Italy, according to the Consorzio per la Tutela del Formaggio Mozzarella di Bufala Campana, it was the Arabs who introduced the water buffalo to Sicily, during their conquest of Sicily which began in 827. The Arabs are known to have influenced Sicilian Agriculture during their rule until conquered by the Normans in the 11th century. The Normans later introduced the water buffalo to Campania and other parts of southern Italy. The water buffalo herds were destroyed by the Nazis during the World War II, which briefly shifted the production of mozzarella to cow's milk. After the World War II, water buffalo from India were brought to Italy to replenish the original herds and resume the production of buffalo mozzarella.